With a 12 percent overall decline this season in NFL's ratings, the big question is what's behind the slide. A new Seton Hall Sports poll conducted this week contains some hints. 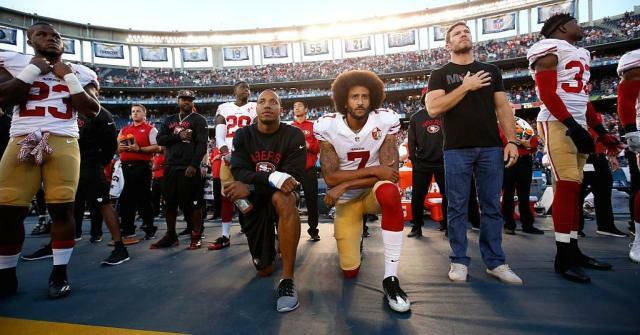 It suggests the leading factor may be the national anthem protests sparked by 49ers quarterback Colin Kaepernick taking a knee during the song. The survey found that when asking people to identify factors contributing to the ratings drop, an overwhelming 56 percent of respondents cited players not standing for the national anthem. Even the pollster was surprised by the results. "It suggests people are reacting to something they don't even see, because the national anthem is generally not televised," said Rick Gentile, director of the Seton Hall Sports Program. But here's the thing: The poll didn't ask people why they themselves aren't watching football games this season, but why they think other people aren't watching football. It's a good example of how the exact questions designed in a poll can affect the results. Considering how much press there has been about Kaepernick taking a knee during the anthem, it's totally possible the people taking the poll thought that's why other viewers aren't watching. They might have answered differently if the question was why aren't they watching. About half the people in the poll said they either follow sports "not closely" or "not at all." That goes to the point, this is their guess for why others have stopped watching. Another note about the poll: Respondents were given a list of seven reasons, asking if each of them could drive lower ratings. People could answer YES to all seven reasons if they want to. There was no limit to how many YES or NO answers somebody could give. That's why these numbers don't add up to 100 percent. While overall ratings in key metrics are down about 15 percent from last year, the number of unique viewers is actually up slightly from last year. The first 43 games of the season reached 167.7 million unique viewers, up from 166.4 million at the same point last year. Some of that might have to do with the NFL's continued international expansion and showing games on Twitter (TWTR). The NFL's issue may not be fewer people watching, but rather that they're spending less time watching. The average viewer has seen 9.0 games this year, down from 9.9 last season. PJ Leary of PJL Media suggested a "young cord-cutters could be getting their NFL fix" outside the home — at sports bars for example. But the current ratings system "does a lousy job of accurately capturing" those viewers. Other factors that have been more widely cited as an explanation for the decline include the distraction of the presidential campaign. Fifty percent of the poll's respondents cited that as the reason. Two of the presidential debates even fell during prime-time NFL games, which could have had a major impact on NFL ratings. When the debate schedule was released, Republican nominee Donald Trump said he was "not thrilled" with the debates competing with prime time football. Overall, between the national anthem protests, concussion issues, domestic violence, lopsided games and the lack of positive story lines, the NFL finds itself in an unusual position. The league, which has historically has dominated in television ratings, finds itself looking for answers and ways to get back on top. They're not the only ones: Across the Atlantic, the English Premier soccer league is facing similar, double-digit declines in viewership, according to the New York Times. "There hasn't been a lot of good news out of the NFL and that starts to wear on the viewer," said Gentile. CNBC's Eric Chemi contributed reporting.